Last Thursday, three by-elections, or special elections, were held in England. All were in seats that Labour MPs had represented before, two of them vacated by death and one by the resignation in disgrace of someone who had been ripping off the system of parliamentary expenses in even more outrageous fashion than had his colleagues. All were comfortably held by Labour, but that wasn’t the story. In two of the seats, Rotherham and Middlesborough, the candidate who came second wasn’t the Conservative or the Liberal Democrat, from the two parties now governing in coalition, but UKIP. Though not quite a single-issue party, UKIP was originally defined by what its snappy acronym stands for. While other British parties may have equivocal attitudes towards the European Union, the United Kingdom Independence Party is quite unequivocal. It wants British withdrawal from the EU, and it wants it now, not to say that it dislikes everything and everyone associated with “the European idea”. 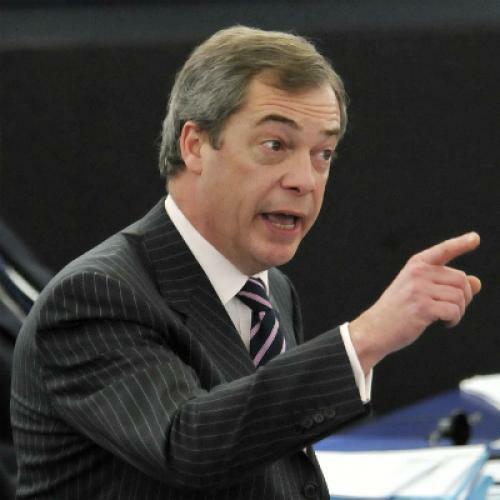 Since 1999, the UKIP leader, Nigel Farage, has been member of the somewhat pointless European parliament which he has used as a bully pulpit—and bully’s the word. Farage is a bumptious, bibulous man who has stepped straight from a provincial English pub, whose opinions he rather accurately and loudly reflects. He dissed the Prince of Wales (who believes in climate change), he harried José Manuel Barroso when he was President of the European Commission for holidaying on board the yacht of a Greek billionaire. And in February 2012 he used the Strasbourg parliament to savage Herman Van Rompuy, the recently appointed President of the European Council. (I know it’s complicated, but that’s a separate job from Barroso’s.) Aside from telling Van Rompuy that he had the "charisma of a damp rag and the appearance of low grade bank clerk", who came from Belgium, which is “pretty much a non-country", he abused him with the words, "Who are you? I'd never heard of you, nobody in Europe had ever heard of you.” Van Rompuy almost fainted from shock. But even if one doesn’t like Farage's manners, that doesn’t mean he's always wrong. (Almost no one outside Belgium had heard of Van Rompuy three years ago.) What’s more, many British voters agree with Farage, or maybe even most voters: For the first time in the 40 years since British accession to what was then the European Economic Community or Common Market in 1972, opinion polls are showing that a majority of British people want to leave. Also for the first time, Cabinet ministers can be heard publicly questioning British membership. The most Europhile of British parties are the “Lib Dems”, and their candidate in Rotherham came eighth, behind an overt racist, as well as a hijab-wearing Muslim lady without political experience. In Parliament, the Tory benches are seethingly Europhobic. (The usual word for those hostile to the EU has become “Euroskeptics”, but I don’t see why skepticism, the the noble word one associates with Montaigne or Hume, should be appropriated by those for whom xenophobic might seem a better term.) And Fraser Nelson, editor of the Spectator, the conservative weekly, confidently says that the United Kingdom will be outside the EU within a few years. Is he right? And has the mood of the British people profoundly shifted in a direction hostile to the whole “European idea”? This caused intense anger in London, since it was a home truth uttered at a very bad moment. The Conservative prime minister, Harold Macmillan, had been rudely reminded of how little Churchill’s beloved “special relationship” meant in practice, by way of the Cuban missile crisis, when he was barely informed by President Kennedy of what was really happening, and by Anglo-American negotiations over nuclear missiles which made it clear that Washington in no way regarded Great Britain as an equal, or wanted her to keep “independent” nuclear weapons. Sensing in his heart that a role “apart from Europe” was now hopeless, Macmillan had applied for British membership of the Common Market. But within weeks of Acheson’s speech, and Kennedy’s brush-off, his application was humiliatingly vetoed by Charles de Gaulle, the French president, who had regarded l’Angleterre as and American stooge or stalking horse since the war. In England (and not only there), “Europe” was always more of an enthusiasm of the political, business and academic elites than of the mass of the people, and there was no great clamour to join even when another Conservative prime minister, Edward Heath, successfully “took us into Europe”. But even after British accession in 1972, the British (more accurately the English) were conflicted, or all mixed up. It was then Labour which was the Europhobic party. Labour had a sentimental affection for the Commonwealth, even though Acheson’s “no political structure, or unity, or strength” was unarguably true, and the Left long suspected that the Common Market was a capitalist conspiracy. When Labour's Harold Wilson became prime minister for the second time in 1974, he staged and won a referendum on continued membership. But his party was verging further to the left, and becoming ever more hostile to Europe. At the 1983 election, withdrawal from Europe was an explicit plank in Labour’s platform, subscribed to by among others a young pol elected to parliament for the first time that year, name of Tony Blair. And the Conservative prime minister Margaret Thatcher won an even larger victory. Not that Thatcher was enthusiastic about Europe. Throughout her 11 years at Downing Street she adopted a position of sarcastic detachment from the continent. Although it was her government that passed the crucial Single European Act which for the first time made a reality of a single free-trade market among member states, she nagged and bullied other European leaders—but then she did that to her own Cabinet ministers as well. They finally tired of her, leading to her defenestration in 1990, after which the Tory party did its best to tear itself apart over Europe. Some of the most ardent English Europhiles were Tories, from Heath to Michael Heseltine to Kenneth Clarke (who is still a government minister, just about). But there is a residual nationalism tending to nativism then to xenophobia among many Conservatives. And the predominant mood of the party has been shifting in a Europhobic direction for decades past. Then along came a born-again Tony Blair. Now Labour leader, he campaigned at the 1997 election with a promise to “take Britain into the heart of Europe”, with a specific commitment to joining the single currency, which had been adumbrated by the 1992 Maastricht treaty and which came into everyday being as the euro ten years later. This was part of the package with which Blair enticed the chattering classes, the metropolitan soggy liberal-left. It had much less resonance with the greater public, which tends not to read platforms or manifestos too carefully. Ten years after his own arrival at Downing Street, Blair departed in 2007, mercifully leaving sterling as the British currency. Looking back, one can see that Blair did far more damage to the European Union, the British position in Europe, and to the “European idea” than Mrs. Thatcher. He was a false friend to Europe, which was more more diplomatically pernicious than her occasional open hostility. The moment when Blair turned his back on Gerhard Schroeder and Jacques Chirac, the German chancellor and the French president, who warned him of the likely disastrous consequences of an invasion of Iraq, and allied himself irrevocably with President Bush, any hope of European solidarity was ruined for years to come. Which brings us back to Farage. After the recent by-elections, he was positively crowing. He made sure to be photographed in front of a portrait of Sir Winston Churchill, whom he claims to revere—although Churchill’s own attitude to Europe was always ambiguous rather than hostile. As early as 1930, he saw the logic of a politically united Europe, but that did not mean that he wanted his country to belong to this “United States of Europe”—and that is not what most British people want now. Then again, the evidence is they do not share the Europhobic obsession of UKIP activists and Tory zealots. If there is wide and deep popular disenchantment with “Europe”, you can find that in Athens and Madrid as well as Rotherham. All polls show that voters here are most concerned not with “an ever closer union” but with specific consequences related to the economy and immigration. The accession of countries from eastern Europe to the EU in 2004 changed migration patterns drastically. Blair then promised that the impact on our jobs market and social infrastructure would be minimal; and as John Denham, the former Labour business secretary, later admitted, while we were told to expect 15,000 migrants a year from the new EU states, “15,000 came to Southampton alone”. And yet what the Europhobes seem unable to grasp is that they have won. The single currency has been a disaster, leaving vast economic and social wreckage throughout southern Europe, and the whole project for European integration has ground to a halt. Any true “skeptic” would want to sit tight in these turbulent times, and see how best we can ride out the storm.